Acer has announced the launch of its Spin 7 convertible notebook in India. The Spin 7 comes just month after the availability of Swift 7, the world's thinnest notebook. The claim to fame with Spin 7 is also the fact that it is the thinnest Windows 10 convertible in the market. Acer Spin 7's thinness has been achieved by using Intel's latest seventh generation Core processors. Acer Spin 7 features a 14-inch Full HD IPS display with Corning Gorilla Glass protection. The notebook is incredibly slim at just 10.98mm and yet manages to offer versatibility of a convertible with 360 degree hinge. Acer Spin 7 can be uses as a laptop, tablet and even in tent mode. “We are extremely excited to launch one of our flagship products in India, something that we are really proud of. Considering that Acer has always focused on delivering industry leading innovations, the Spin 7 is a reflection of just that. Our top-of-the-line Spin 7 will allow consumers to enjoy extreme portability without compromising on performance or versatility," said Chandrahas Panigrahi, Senior Director and Consumer Business Head, Acer India. 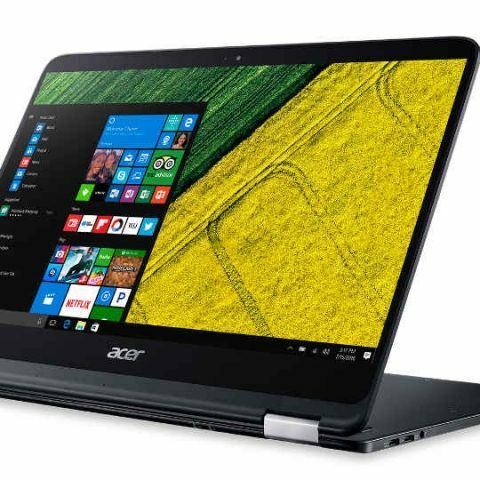 At Rs 1,09,000, Acer Spin 7 does come as a premium offering but it is also built using premium materials with an all-aluminium unibody design. The convertible runs Windows 10 and comes with 8GB DDR3 RAM and 256GB SSD storage. Acer Spin 7 also offers a fanless design similar to the Swift 7 and weighs just 1.2 kgs. Acer Spin 7 offers dual USB Type-C port and offers upto 8 hours of battery back-up. The convertible is the latest in the series of premium Windows notebooks from Acer. With Spin 7, Acer is joining the long list of PC makers ditching traditional ports in favour of slim and lightweight design propelled by Intel's latest processors and USB-C port. which Android version is available in Acer Iconia a1-830 TAB?